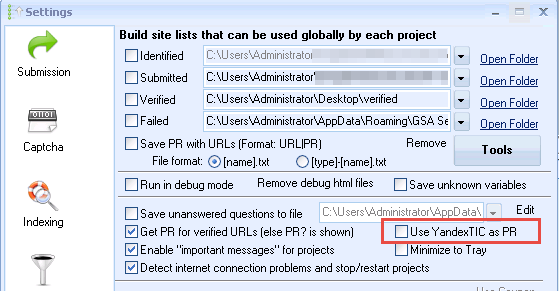 GSA PR Emulator - How does it work? GSA PR Emulator was designed to help close the gap that Google left when they shut down their service many software/services used for retreiving PR(Page Rank) of a URL or domain. In April 2016, the very important service toolbarqueries.google.com was shut down. We noticed PR wasn't updated since 2013 so a lot of us knew the service was near the end. However, many SEO Tools still relied on PR to help filter good quality and bad quality URL's. In fact, it's very important to not build links from toxic sites. As SEO's, we still need a way to filter links by quality metrics, but with Google PR gone, we were left without many options. Luckily, we've come up with a solution called GSA PR Emulator which is able to deliver valuable metric data for each URL/Domain, allowing users to filter URL's again. GSA PR Emulator delivers the PR values we're all used to (PR0=worst, PR10=best) by using other services who offer quality metric data that can be used in place of PR. You can choose from many metric services such as Yandex, Majestic, Alexa and SemRush. Once you have it running, you can choose the metric data you want to use by selecting the combobox at the top IE:Max(TrustFlow,CitationFlow)/10). As an example, if you were to choose CitationFlow/10 option via the combobox, and set GSA Search Engine Ranker to “skip sites below PR 1” PRemulator will automatically filter all URL's that are below Citationflow = 10. PR2 would filter everything below Citation flow = 20, PR3 would filter everything under CF=30 and so on and so on. For some metrics such as Alexa, Yandex or SemRush that don't use a simple range of 1-100 for their metrics, you can define your own by clicking on the “edit ranges” label located right beneath the combobox. Also, if you would like to see what the ranges are set at by default, clicking the edit ranges button will let you view this info. However, changing ranges isn't required since we have default ranges in place that can be used. The PR replacement is already in place and each program running alongside PR emulator will no longer be sending it's requests to Google, but instead GSA PR Emulator. *Note* - PREmulator needs to be running in order for it to intercept PR queries from other tools. *Important* - If you're using PREmulator with other programs, make sure proxies are disabled for PR checking in the external programs. Instead, PREmulator has its own proxy checker where proxies should be added. Proxies should be used to prevent getting temporary blocked from services. You can add your own proxies by clicking the “proxies” button. After clicking the proxies button, the proxy window will open. Add Proxy - Select this option to import your proxies from file or paste from clipboard. Alternatively, you can select “find online + test” if you want the public proxy scraper to scrape and test proxies for you. 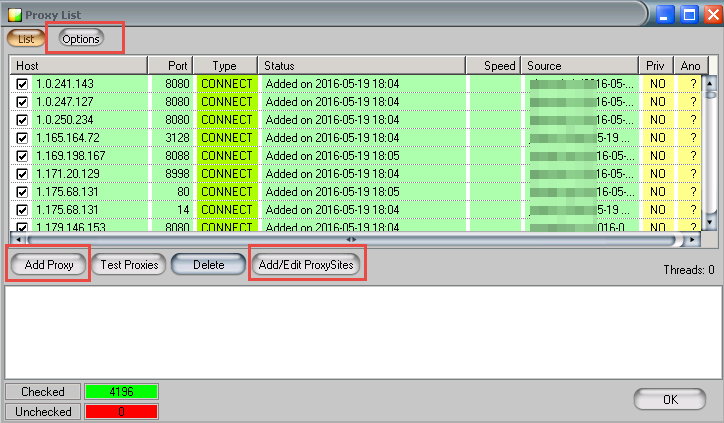 Add/Edit Proxysites - Clicking this button allows you to add/edit proxy sources in case you want to add your own or select the proxy sources you prefer. Options - If you're using public proxies, the options button allows you to fine tune how the public proxy scraper should work by giving you more options such as “automatically search for proxies every x minutes” and many more useful options. PR Emulator also works as a stand alone tool and doesn't require external tools to run and filter URL's. To use it as a stand alone tool, simply click the “Load URLs” button on the main screen. A new settings window will open, allowing you to import your own list of URL's, choose the save destination, save format (.txt,.csv,excel) and assign a PR filter (optional). 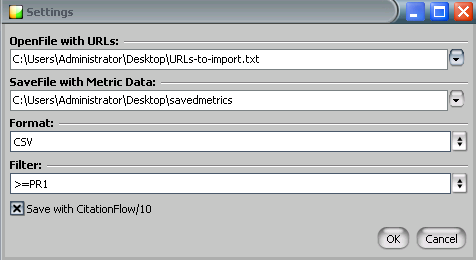 Then click ok and watch as PREmulator starts to pull in metrics and filter URLs on auto-pilot! First read the GSA PREmulator section above to see how it works and how to it up. Step 1: In Search Engine Ranker, disable proxy checking for PR Options → Submission → Use proxies → PR checking. Step 2: Disable the in-build YandexTIC replacement in Options → Advanced → Use YandexTIC as PR. Step 3: Create a project or open an existing project → Options tab → Enable “Skip sites with a PR below X” option and set PR to desired number. If everything is configured properly you will see the URL's start to appear in the PREmulator window along with information in the log. That's it! In Platform Identifier, click the “New Project” button and setup a project however you like, but this time be sure to also enable the “skip sites below PR x” option. That's it, now Platform Identifier and PR Emulator will work together filtering your URL's on 100% auto-pilot.